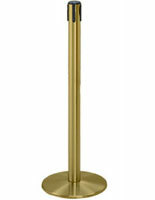 This satin brass crowd control post features a 7 1/2 foot red retractable belt. 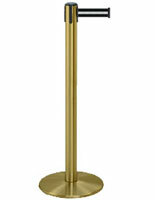 The full dimensions measure 38" tall, a 13 1/2" diameter base, and weighs 24 lbs, the belt is approximately 2" wide. 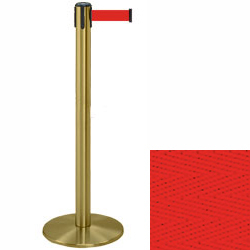 The quality and craftmanship of stanchions from Displays2go is unparalled anywhere in the marketplace.